Planning permission has been granted for a new £23 million flagship leisure centre in Fleet, Hampshire. It will be housed in a state-of-the-art building with an energy efficient roof and sustainable timber detailing; it will be built on land opposite the existing leisure centre in Hitches Lane. The new building will have a 25-metre, 8-lane competition pool, a 25-metre intermediate pool, a learner pool and a fun pool. There will also be a 120-station gym, a climbing wall, a coffee shop, three dance studios, a crèche, multiple sports pitches and a sports hall the size of eight badminton courts. The site is at the edge of a new country park that will be completed in 2017, the same year as the leisure centre. 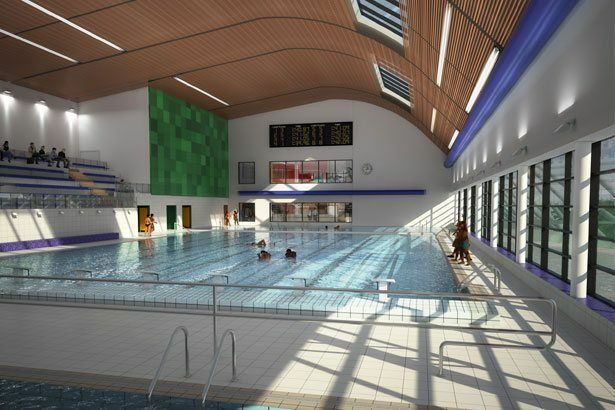 F T Leisure will be the principal sub-contractor responsible for the water treatment and filtration systems for the pools as well as for the 25-metre moveable floor system, 2 disabled access platforms and the water features. Each pool will have a dedicated water treatment and filtration system based on traditional medium rate sand filtration with disinfection, pH correction and UV sterilisation. The client for the project is Hart District Council and the main contractor is Willmott Dixon working together with GT Architects and Sheerwater Consultancy.